﻿ Aspery Hotel, Phuket | FROM $15 - SAVE ON AGODA! "Family mart (convenience store) just 2 building beside this..."
Have a question for Aspery Hotel? "Stuff were good & helpful." "The staff are friendly Breakfast is okay Hotel is clean Quiet location"
"Will recommend this and visit again." 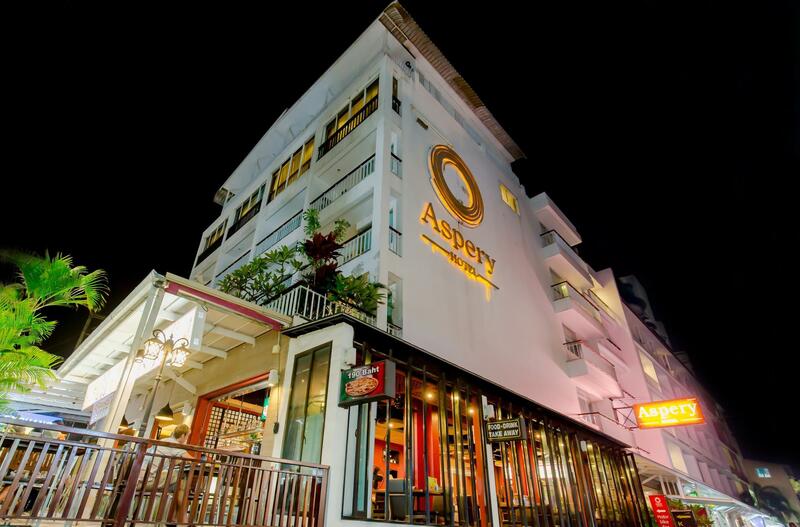 Visit the Aspery Hotel and experience all that Phuket has to offer. Situated just 15 km from the city center, this hotel is a great place to stay if you want to be out and about. 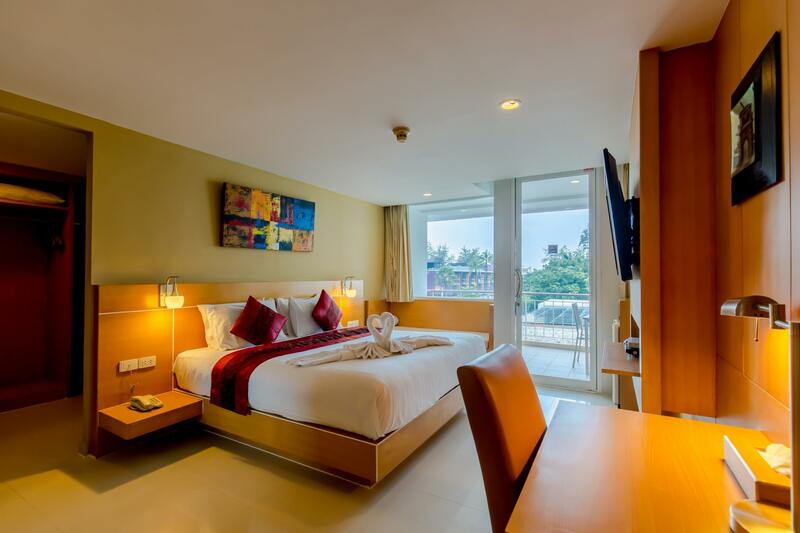 The rooms here overlook the city for picturesque views of Phuket. 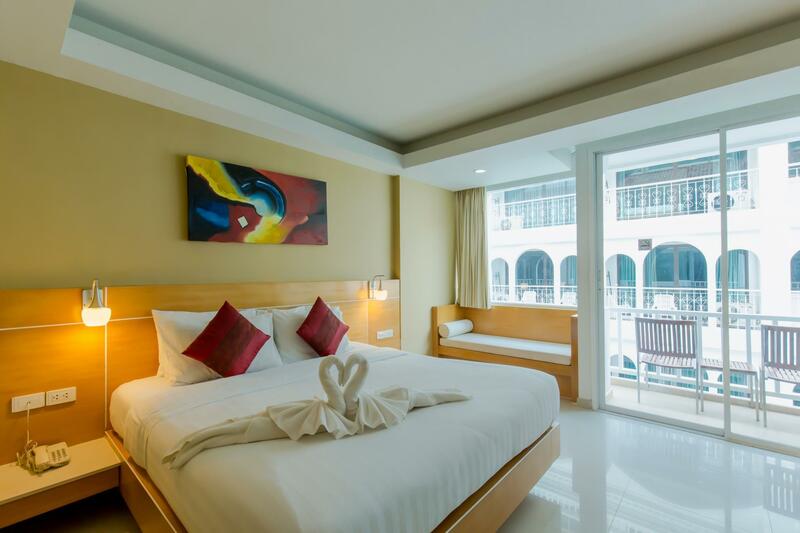 This hotel is near Mister Singh Fashion Gallery Tailor, Chabad House Phuket, Banana Walk Shopping Mall, Pa Tong Mosque, and Ocean Plaza Patong. The Aspery Hotel has a hot tub, a spa, ticket services, and an outdoor swimming pool among other great facilities. This hotel has various convenient features, such as safety deposit boxes, a laundromat, a salon, a currency exchange, and a smoking area. It features family rooms for those who wish to keep the whole family together in one large room. With a kids club, it offers traveling parents a fun-filled and secure childcare resource. Also equipped with a kids swimming pool, it is perfect for children of any age. Whether it's a bar or room service, this hotel has a variety of dining and snacking options. If you want to spend your day simply relaxing and unwinding, get a massage nearby. Offering guided tours, the Aspery Hotel is a great place to stay to learn about the area and see everything you can while you're here. There's free Wi-Fi in all rooms, as well as Wi-Fi in common areas, ensuring that guests are always able to contact their loved ones back home without overspending on international charges. With dry cleaning services, a concierge, as well as daily housekeeping, the Aspery Hotel has a number of convenient services for you to utilize. The front desk is open around the clock, ensuring that there is always someone behind the desk to assist you at all hours of the day or night. The Aspery Hotel is pet-friendly, saving you the trouble of finding someone to look after your pet while you're away from home. The Aspery Hotel offers a variety of transportation options, such as bicycle rentals, car rentals, and airport transfers. Phuket Bus Terminal 2 is 10.8 km away. The nearest airports are Phuket International Airport (HKT) and Krabi International Airport (KBV), which are situated 23 km and 78 km away. The Aspery Hotel offers check-in from 02:00 PM and check-out until 12:00 PM. "Staff very helpful, strategic location and easy to find food"
Elevator will not be accessible for guests staying in Standard rooms. 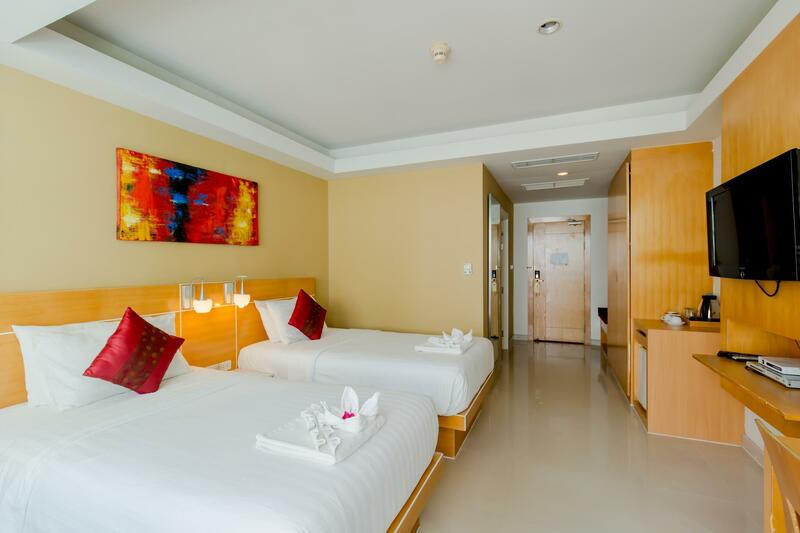 Standard rooms are located in another building which is 20 meters away from the main building. Dear Value Guest, Greeting from Aspery Hotel, Once again, thank you very much for choosing Aspery Hotel for your recent stay in Phuket. We sincerely hope you had enjoyed your stay with us and were able to exceed your expectations and thank you for your comment. We look forward to serving you again when your travel plans bring you to Phuket, Thailand. Best Regards, Sujira M.
Dear Vinit Greeting from Aspery Hotel, Once again, thank you very much for choosing Aspery Hotel for your recent stay in Phuket. We sincerely hope you had enjoyed your stay with us and were able to exceed your expectations. We look forward to serving you again when your travel plans bring you to Phuket, Thailand. 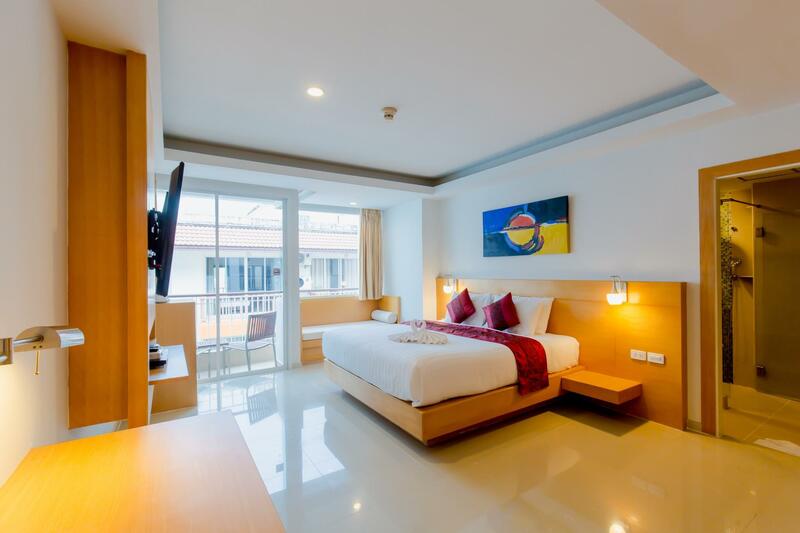 Best Regards, Sujira M.
Aspery is quite near Patong Beach (~5 mins walk) and there are a lot of restaurants nearby. Most of the staffs are able to speak/understand English which is a plus point. Easy to get ‘Tuk Tuk’ if you want to go further. The only thing you to be aware is not all room types are accessible by lift (some need to climb stairs). Dear Kian, Greeting from Aspery Hotel, Once again, thank you very much for choosing Aspery Hotel for your recent stay in Phuket. We sincerely hope you had enjoyed your stay with us and were able to exceed your expectations. We look forward to serving you again when your travel plans bring you to Phuket, Thailand. Best Regards, Sujira M.
I have had a wonderful stay both times I was here. The staff are fantastic, the managers have gone out of their way to help with issues and most importantly the rooms are modern and very clean. Dear Morgan, Greeting from Aspery Hotel, Once again, thank you very much for choosing Aspery Hotel for your recent stay in Phuket. We sincerely hope you had enjoyed your stay with us and were able to exceed your expectations. We look forward to serving you again when your travel plans bring you to Phuket, Thailand. Best Regards, Sujira M.
I was very happy with my stay at the Aspery Hotel. It is in a great location, my room was spacious and clean and the staff were helpful and friendly. I do have two minor criticisms. There are no covers on the windows other than drapes, which necessitated keeping the drapes closed most of the time. Also, like many hotels, the wi-fi is very poor. However, overall the Aspery was great value for money and I would happily return. Dear John, Greeting from Aspery Hotel, Once again, thank you very much for choosing Aspery Hotel for your recent stay in Phuket. We sincerely hope you had enjoyed your stay with us and were able to exceed your expectations and thank you for your comment. We look forward to serving you again when your travel plans bring you to Phuket, Thailand. 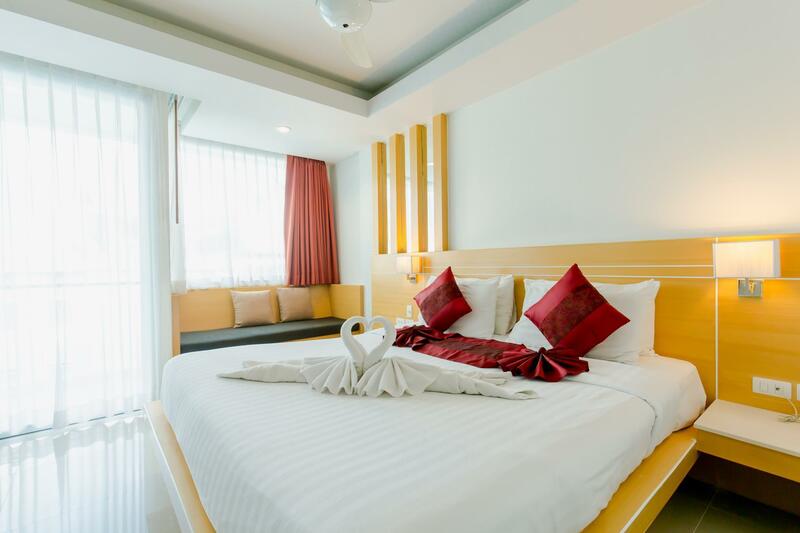 Best Regards, Sujira M.
We had an issue with our booking due to Agoda locking on rooms that weren’t available but the staff were very helping in fixing the problem. They are very friendly and helpful and the rooms are spacious. Would definitely recommend this hotel to people who are on a budget and looking for decent accom. Dear Catherine, Greeting from Aspery Hotel, Once again, thank you very much for choosing Aspery Hotel for your recent stay in Phuket. We sincerely hope you had enjoyed your stay with us and were able to exceed your expectations. We look forward to serving you again when your travel plans bring you to Phuket, Thailand. Best Regards, Sujira M.
Located slightly away from the beach and main nightlife area but still within walking distance of about 15 mins. Staff are generally friendly and helpful. Discount vouchers from hotel dining and massage services are given but a bit misleading. Ask hotel staff for clarity before using them. Dear Lee, Greeting from Aspery Hotel, Once again, thank you very much for choosing Aspery Hotel for your recent stay in Phuket. We’re sorry you were unhappy - we’ll work hard to fix the issue you experienced. Thanks for letting us know. 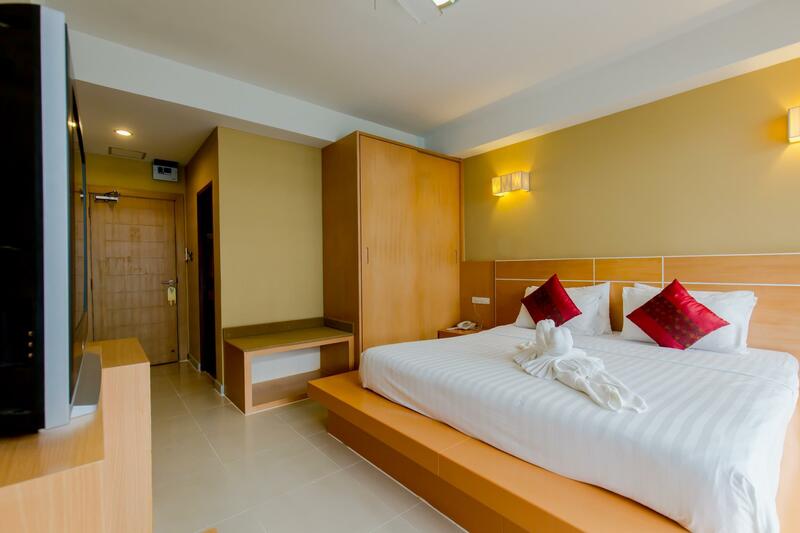 Best Regards, Sujira M.
Only 5 minutes walking to Patong Beach. 10 minutes to Jungceylon Mall & Bangla street. Family mart (convenience store) just 2 building beside this Hotel. Hotel also offers you 20% discount for breakfast/ lunch/ dinner at their restaurant (located beside the receptionist). Dear IHSAN, Greeting from Aspery Hotel, Once again, thank you very much for choosing Aspery Hotel for your recent stay in Phuket. We sincerely hope you had enjoyed your stay with us and were able to exceed your expectations. We look forward to serving you again when your travel plans bring you to Phuket, Thailand. Best Regards, Sujira M.
- No lift. Only narrow staircase access to multi-story room - Conceierge dragged and scratched our expensive high gloss suitcase along concrete walls and stairs on way to room - Curtain has giant blood stain on it - Bathroom covered in black mould - Light switches and ceiling fan switch not functional. Literally could not turn off fan or fan lights. How were we meant to sleep? - Ceiling fan was barely held onto ceiling and we watched it dangerously wobble expecting it to drop down onto the bed at any moment. - Room smelled like raw sewage. - Hotel is on top of a rub and tug. - Wifi didn’t even work. - We informed staff of all issues shortly after checking in and that we would not be staying there because of how horrible it was. This was meant to be a basic (but nice) short stay accomodation on our honeymoon before travelling to Bangkok. Our experience left a black mark on our honeymoon. Staff were inconsiderate, rude and refused to refund any money (we paid for 4 nights). Booked this hotel because it is advertised with a bath tub & shower in the room. However it is not as per description. Already mentioned that we booked this hotel because of the bath tub availability as per advertised. They apologized for the error in Agoda. Hoping for free upgrading but instead we have to pay extra for room with bath tub. It would be much cheaper if we choose another hotel if just have a shower compared to here. However it is a new hotel, therefore all the facilities are new, and very near to the halal restaurant, spa, and other shops. Dear Suraya, Greeting from Aspery Hotel, Once again, thank you very much for choosing Aspery Hotel for your recent stay in Phuket. We sincerely hope you had enjoyed your stay with us and we would like to apologize about for your convenience. We look forward to serving you again when your travel plans bring you to Phuket, Thailand. Best Regards, Sujira M.
Location is excellent, located few hudnred metres away from the beach and also the shopping areas. You can take a walk everywhere. Laundry available 24hours, 50baht per kilo. Wifi's good. Took room with breakfast, it was excellent. Really worth the money. Staffs are friendly and helpful. Very quiet environment. Dear Ravinthiran, Greeting from Aspery Hotel, Once again, thank you very much for choosing Aspery Hotel for your recent stay in Phuket. We sincerely hope you had enjoyed your stay with us and were able to exceed your expectations. We look forward to serving you again when your travel plans bring you to Phuket, Thailand. Best Regards, Sujira M.
Got an upgrade upon check-in to a superior room with balcony, nice spacious room, very comfortable bed! However the room was smelly from the drainage and the toilet seat was stained. Good buffet breakfast and nice pool area on the 5th floor. Dear Silvana, Greeting from Aspery Hotel, Once again, thank you very much for choosing Aspery Hotel for your recent stay in Phuket. We sincerely hope you had enjoyed your stay with us and were able to exceed your expectations. We look forward to serving you again when your travel plans bring you to Phuket, Thailand. Best Regards, Sujira M.
Dear Khun Peeratchaya, Greeting from Aspery Hotel, Once again, thank you very much for choosing Aspery Hotel for your recent stay in Phuket. Regarding the Standard room is no elevator and we already mention at hotel information. We sincerely hope you had enjoyed your stay with us and were able to exceed your expectations and thank you for your comment. We look forward to serving you again when your travel plans bring you to Phuket, Thailand. Best Regards, Sujira M.
Dear Jill, Greeting from Aspery Hotel, Once again, thank you very much for choosing Aspery Hotel for your recent stay in Phuket. We sincerely hope you had enjoyed your stay with us and were able to exceed your expectations. We look forward to serving you again when your travel plans bring you to Phuket, Thailand. Best Regards, Sujira M.
Bad sewage smell hotel: i stayed there 7 days of smelling sewage in my room and throughout the hotel. The hotel in good location, have somewhat good food in restaurants but run down bad smell, if you book a regular room it is in a separate building you will have to use steps to get to your room. I could write a two page book about this hotel but I end with just a few words. I wouldn't recommend or stay again. Hotel was walking distance to Patong Beach. Breakfast was good enough as I’m not fussy traveller. Roof top pool was nice with an awesome view. Hotel restaurant had a cosy ambience by the road side. Our room 202 had a bad stench smell coming from toilet. The stench was there throughout our 5 days stay. Otherwise a good decent hotel with a good sleep with no noise. This hotel is 500 m from beach I think . You have family mart next to it. Has a swimming pool on the top. They have Motetcycle for rent 250 THB per day .Rooms are nice and clean .Staff is Helpful .i only think I would say is the pillow are too hard . Very hard to get Good night sleep. 1.2 km from shimming mall and bagna walking street . Many Resturant near by and many tour shops. Will come back again. Price is the best Factor. Dear Tajinder, Greeting from Aspery Hotel, Once again, thank you very much for choosing Aspery Hotel for your recent stay in Phuket. We sincerely hope you had enjoyed your stay with us and were able to exceed your expectations and thank you very much for your comment. We look forward to serving you again when your travel plans bring you to Phuket, Thailand. Best Regards, Sujira M.
Me and my wife stayed at this hotel for 14 days and the staff were very pleasent and service with smile. Room service excellent and trustworthy .Breakfast was top of the range.Lunch and dinner very tasty and plenty of choice of food. Massage at the hotel very nice and same price as outside. Laundry in the hotel was same price as outside. Very helpfull tour operator at the hotel (May)She arrange 4 trips for us and everyone was excellent. I highly recommend anyone going Patong. Dear Value Guest, Greeting from Aspery Hotel, Once again, thank you very much for choosing Aspery Hotel for your recent stay in Phuket. We sincerely hope you had enjoyed your stay with us and were able to exceed your expectations. We look forward to serving you again when your travel plans bring you to Phuket, Thailand. Best Regards, Sujira M.